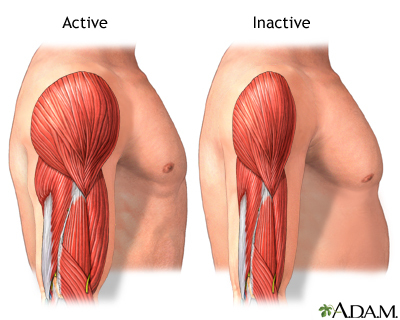 People may lose 20 to 40 percent of their muscle -- and, along with it, their strength -- as they age. Scientists have found that a major reason people lose muscle is because they stop doing everyday activities that use muscle power, not just because they grow older. Updated by: Luc Jasmin, MD, PhD, FRCS (C), FACS, Department of Surgery at Providence Medical Center, Medford OR; Department of Surgery at Ashland Community Hospital, Ashland OR; Department of Maxillofacial Surgery at UCSF, San Francisco, CA. Review provided by VeriMed Healthcare Network. Also reviewed by David Zieve, MD, MHA, Medical Director, Brenda Conaway, Editorial Director, and the A.D.A.M. Editorial team.